This week we will continue with “Are You Addicted to Facebook”, I will provide tips on how to take action and make changes in your life to avoid the pitfalls of addiction to Facebook. Do you have many friends on Facebook but you’re still lonely and feel abandoned by friends in your sphere of influence? Is your personal life a struggle, and you just don’t fit into any group of friends? Have you found one or more Facebook friends and believe they are your best friends? On Facebook do you pretend to be someone that you’re not? Does Facebook interrupt your sleeping patterns, you go to bed at a certain time and a friend texts you from Facebook and you spend hours at texting them, knowing you have to get up early for work. Do you make up excuses to stay up late at night to fill a need for feeling important. 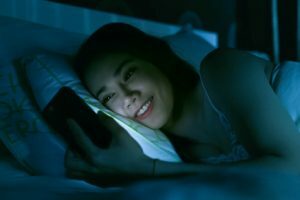 Many will look at Facebook late at night while others are sleeping. Your addiction?? Now ask yourself this question, why am I on Facebook? Why do I spend so many hours talking to strangers I don’t even know a thing about and I am now calling them my close friends? Do I ask them personal questions about their lives, or ask them about family or about their work? If you’re just trying to fill your list of how many friends you have by the numbers of friends you have on Facebook, then I think there is a problem. Ask yourself, what am I getting out of Facebook that helps me as a person, that helps me to be a better person than I a?. How am I enriching others by what I post? Do I truly care about the people I have as friends? Do I respond to some of the needs they have? Do I encourage them when they are hurting? Do I respect the people on my friend’s list? Do you want to do a reality check with the amount of time that you spend on facebook? Do you care about Facebook interfering with your family time, or the time you are at work? If you are, I want you to do something that will require some time and effort. This will be a self-evaluation on how many hours you’re on Facebook. For some it will open your eyes, and others..they may not even care! Next week, I will continue with “Are You Addicted to Facebook? There will be some tips on how to deal with addictions to Facebook and what to look for in those who you feel have a problem with facebook. There are benefits to having friends on Facebook, I have several that I look forward to talking with on Facebook and talking with them on the phone. I use Facebook for helping others through difficult times. So, if you feel that your addicted to Facebook or are not sure, ask yourself these questions. Do I spend to much time on Facebook during the day? Do I have to keep building my friends list to prove I’m popular? Do I have facebook on my cell phone while eating meals? Do I wake up and go to bed with checking my Facebook page? Do I need help with my addiction to Facebook? If you answered yes to any of these questions, you need to contact Dr. Mike and set up an appointment. Please call Dr. Mike at 303.880.9878 if you need help. This entry was posted in angry spouses, I want to save my marriage, relationships and tagged addicted to facebook, applicable counseling and coaching services, dr mike relationship counselor and divorce counselor, facebook, facebook Addiction disorder, sleeping patterns. Bookmark the permalink.